I got this gun from Ken Duglan from Atkins Grant & Lang in England. 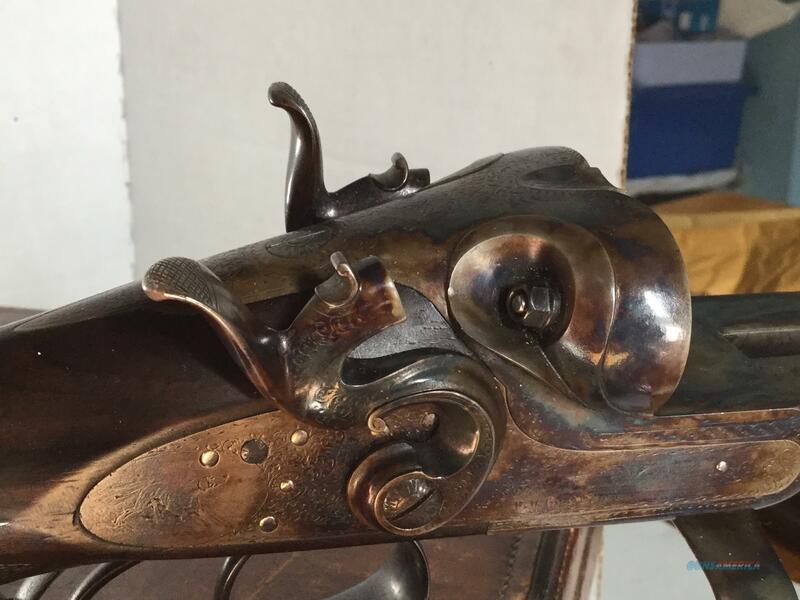 The gun has been Sleeved & then reproofed for 2 3/4'' & 1 1/4oz, and has been stamped as such. I believe Bill Blacker did the sleeving. Before re proof it was re case hardened, & it has lovely colours, but not gaudy....this work,along with the sleeving was done circa 1980...so they have had time loose that flashy just redone look. I believe the colouring was done by the renowned Ray St Ledger. When I got the gun I sent an Email to Graham Greener to ask for any info. He got back to me & said it was built in 1901, was a mid grade gun , 35 guineas or so, but was a ''Special Order'', & was built by the team of workers that usually built the top end stuff, he supplied the names of these men, but I have lost the email, but I remember the action filer was a Mr Camm And indeed the shaping of the action, especially the beautiful percussion fences & hammers is really some top notch work. I will ask Graham again for info. I also sent the gun to Abe Chaber, who gave me thumbs up. He checked the bbl wall thickness for thin spots, I honestly forget the min thickness he found, but he said they were plenty meaty, as you would expect in a fairly recently sleeved gun proofed for 1 1/4oz The Jones under-lever moves smoothly & really clamps the bbls down tight, ever thing is dead on solid when closed. The bbls have no dents, there are some tiny pin head sized '' stains" here n there,,not rust., I am just trying to be picky here. A little blue thinning around muzzles from cleaning , there is one 1/4'' spot where forend has rubbed bluing off, but can only be seen when end is off. Bores are bright shiny with no pits. I have shot a few thousand low psi 1oz reloads through her without a hiccup , the weight really soaks up the recoil, & I am sure 1 1/4'' load such as it was proofed for would be very pleasant to shoot as well. It makes a really cool old school clays gun, it is slightly muzzle heavy, a good thing to keep your swing going.